Decorative aluminum serving pieces are true Mid-Century Modern gems. Popular during the 1950's and 1960's, these trays have a dull finish with embossed patterns on them. These are a perfect touch for any occasion. Extra large serving tray with beautiful floral pattern. 20" round. True Mid-century modern aluminum rectangle serving tray with handles. Embossed with grape leaf pattern. 15.25" x 11.25" rectangle. 17.25" with handles. Mid-century modern aluminum serving tray. Acorn embossed, round, with handles. 15" round. 17.5" with handles. 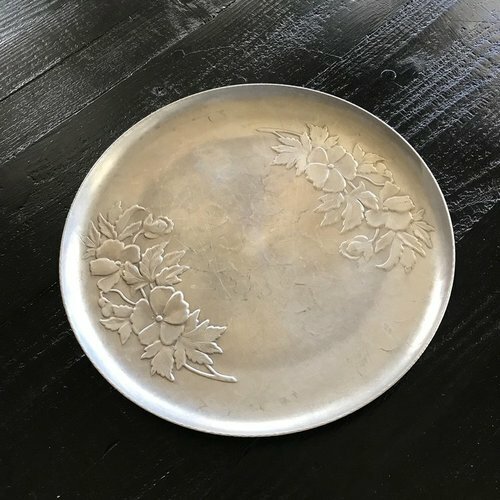 Embossed with a beautiful floral design this tray is 11.5" round. 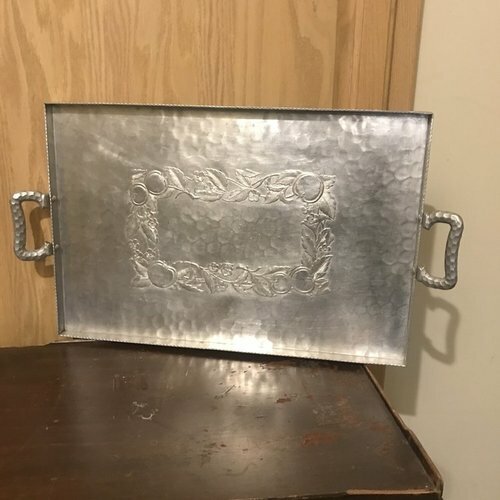 Mid-century modern aluminum serving tray. Round, Plumeria floral embossed, with scalloped edge. 17" round. 14" x 9.5" this rectangle tray is embossed with flying ducks on it. Rectangle aluminum tray with handles. Orange embossed motif. 19.75" x 13.25" rectangle. 23" with handles.